I hope you all had an amazing weekend. I went to San Francisco over the weekend with 15 girlfriends and had the best time! We jam packed so much into the short amount of time we had in the city and I loved every minute of it. On Thursday I will be sharing all of the pictures and details of my trip so stay tuned for that. 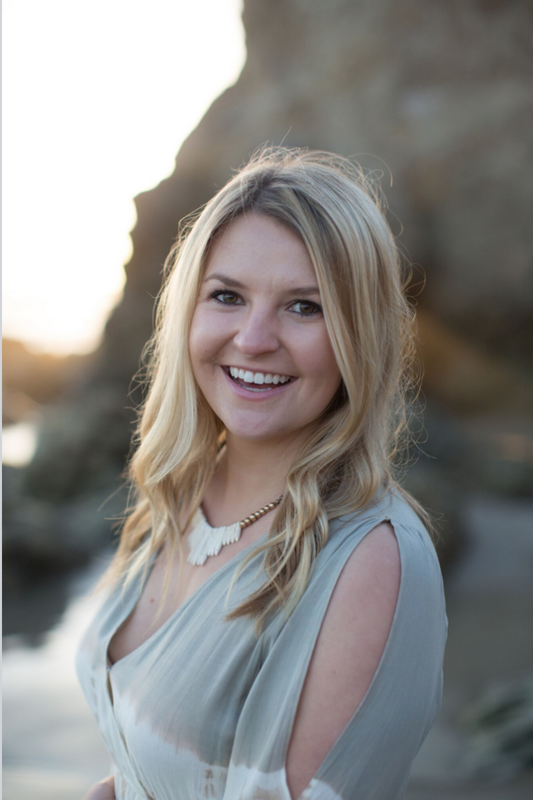 Today I have teamed up with ORGO Lite to share with all of you what I put in my carry-on suitcase and how having an ORGO Lite travel organizer makes traveling so much easier and convenient. The organizer slides out and can fit in a sink or on a counter top. It then slides back in to make the organizer more compact for suitcases and traveling purposes. 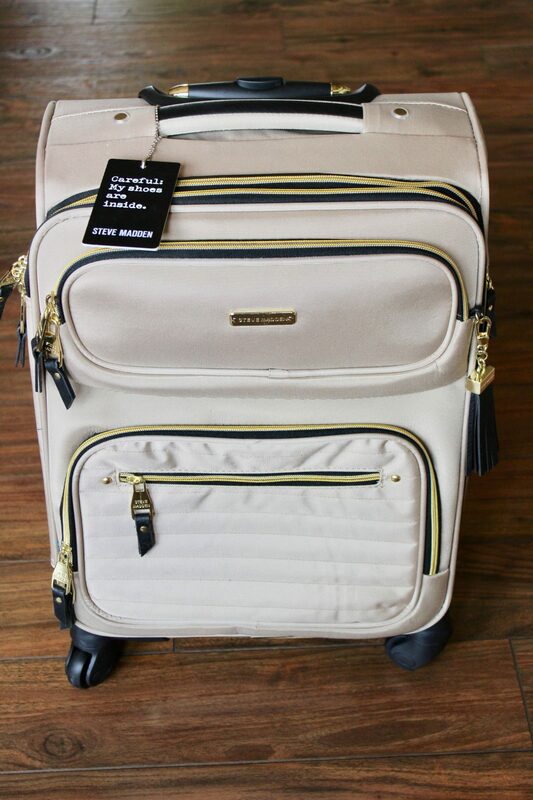 I always use my Steve Madden roller suitcase as my carry-on and it has the perfect amount of room. I found this suitcase on sale at Marshalls and it is my new favorite carry-on luggage! The suitcase has the cutest bag tag (as shown above) and so many different pockets/compartments for added storage. Shown above are some of my must have travel items. I always travel with an extra outfit in case my flight is either cancelled or delayed and I get stranded at an airport. I also always put more expensive items in my carry on such as my blow dryer, straightener, and jewelry in case my bag gets lost. I also always put more expensive items in my carry on because my check in luggage always gets thrown around and beat up so I try to avoid breaking anything expensive. I usually always wear slip on shoes to the airport because they are easy to take off and easy to put back on. I also hate wearing sandals while I fly because it grosses me out and my feet always end up freezing mid-flight and that’s never enjoyable! I also never travel without my sunnies, my phone charger, and headphones. 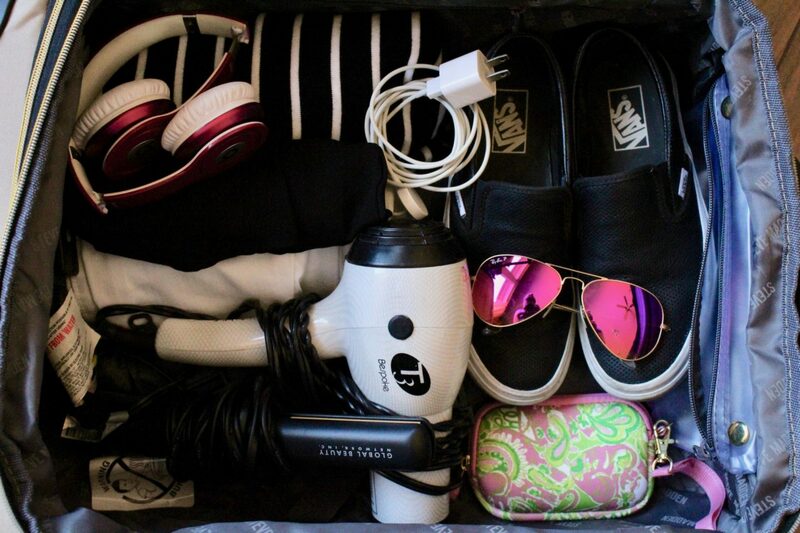 These are all must have travel essentials and I don’t enjoy traveling without them! I also highly recommend putting your phone charger in your carry-on luggage instead of your check in bag because again, if you get stranded at the airport, you won’t be there with a dead phone. Headphones are also a must have (I forgot them during my flight to Burbank two weeks ago and was so bored) in case you need to noise cancel out screaming babies or just jam the whole flight. 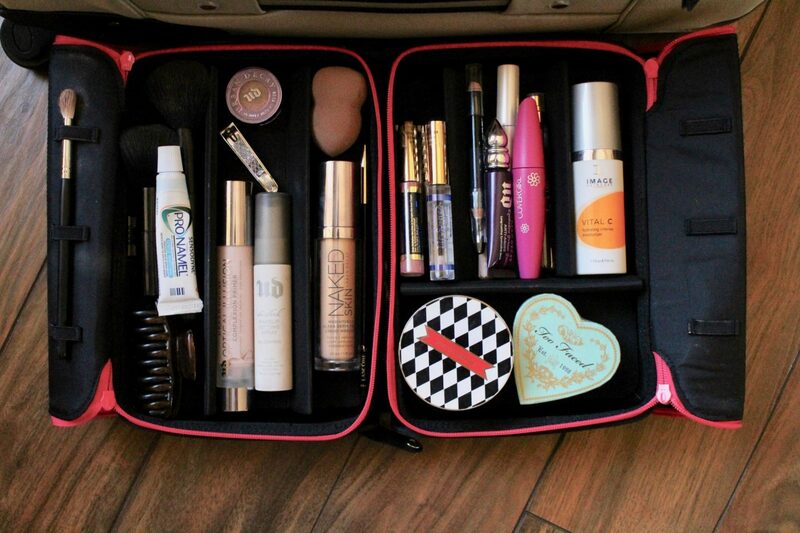 I also always put my makeup and overnight necessities, including a toothbrush and toothpaste in my carry-on luggage. I always like to freshen up after a long flight and having all of my makeup and toiletries in one place makes it so much easier. Above is a picture of my ORGO Lite travel organizer. They come in many different colors and seriously make traveling so much easier. I used to throw all of my makeup into a bag and get to my destination with broken eyeshadows and a bag full of unorganized chaos. This organizer keeps all of my products in place and prevents makeup from breaking, which is always a plus. There are different pocket sizes and designated spots for brushes to help you organize better. I was so surprised at how much fit in my ORGO Lite and I still have room for more! Make sure your phone is completely charged before takeoff. Always pack a toothbrush, a change of clothes and any other overnight necessities, just in case. Roll your clothing, don’t fold. Saves you so much room. Plan your outfits in advance, don’t just throw random clothing into your suitcase. Make a packing list in order to avoid forgetting last minute items. 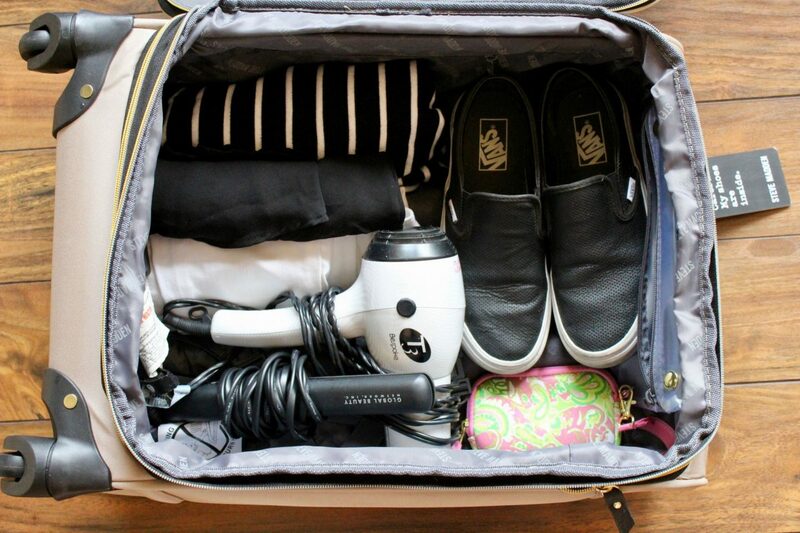 I hope you all enjoyed what I pack in my carry-on and find these travel tips useful!